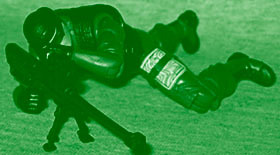 By 1986, GI Joe was entering its fifth year, and running out of ideas. The Joes had been getting less "military regulation" for a few years, but 1986 really upped the ante. Plus, since a lot of old toys were no longer being sold in stores, their "role" on the team had to be filled by new characters. You think we ever would have met Beachhead or Leatherneck if Stalker and Gung-Ho were still hanging around? No way. And since Recondo was about to disappear into the wilderness, it was time for a new outdoorsy specialist, Low-Light. A self-taught expert in image intensifiers, Low Light maintains and repairs all of his own night-vision equipment. He also holds the patents on two components in the latest models. He is extremely good at staying still and quiet for long periods of time and has a natural ability to blend in with his surroundings. If you're a Cobra Trooper out in the bush on a moonless night, in darkness so thick you can't tell whether your eyes are open or not, you may be sweating bullets and your nerves are taut with anxiety, but there's somebody else out there. He's sitting cool in the dense shadows, watching every move you make and resting the cross hairs of his night scope on the center of your head. His name is Low Light, and he owns the night. The original filecard for Low-Light was a bit cooler: "As a child in North Dakota, Low-Light was afraid of the dark, timid with animals, and shy of loud noises... until one precarious hunting expedition with his father. Low-Light somehow lost his way in the impenetrable darkness. He was found three weeks later with his flashlight, .22 rifle, and a grin from ear to ear. Ten years later he was an instructor at the Army marksmanship program in Fort Benning and a self-taught expert on image intensification." See, isn't that better? Anyway, Low Light (yeah, the hyphen comes and goes) was the Joes' first real sniper, which means he automatically has a bit of cool about him. Low Light is basically a repainted SpyTroops Torpedo, but it works so well that you won't mind for a minute. After all, Torpedo was dull as a pile of dirt, so his plain uniform is prime for many a simple repaint. Low Light is gray instead of green, but the jumpsuit look suits him perfectly. 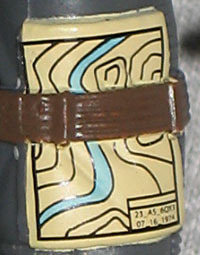 He has a map strapped to his left thigh, and though this is a feature found on the earlier use of the mold, it's received much more intricate paint apps here. It used to just be a white square, but now it's a complete topographical map. Nice! His arms come from the Valor vs. Venom Snake-Eyes (one of the many VvV Snake-Eyeses, anyway). Even the head is a straight re-use. This is the same cabeza Torpedo was sporting, though the watch cap could have been taken directly from the original Low-Light. His hair is blonde, as it should be; there were a few figures named "Low-Light" in the later years of the line, but they were sporting black hair and beards - might as well have been a new guy altogether. But this one is back to the classic look, and that's nice. Of course, the overall look is bolstered by a few of the accessories. Low Light has red-lensed goggles, same as the 1986 figure, but this time they're removable. Guess it was easier to do that than mold a new head. He's also wearing a vest that originally came with a VvV Gung Ho - it does a decent job of approximating the vest Low Light used to wear, even if there's a huge gap in the back that was originally meant to accommodate Gung Ho's idiot action feature. They even painted a little red patch on the right shoulder, to mimic the old style. Nice attention to detail, that. Low Light is no shirker when it comes to weaponry. He's got a black pistol, which, you know, is nice enough, but it's still kind of dull. This is Low Light! We need a sniper rifle! And the one included here is an all-new mold, a South African-made Mechem NTW-20. To give you an idea of the size bullets this thing fires - that magazine on the left side of the gun? It holds just three rounds. Blam! This thing's a monster. The reason Hasbro used those Snake-Eyes arms was so the figure would have articulated wrists, and better be able to hold his gun. Part of Hasbro's DTC program, Low Light was only available through online retailers and in limited quantities at select Toys Я Uses... Us's... Toys Я Us locations. That means a lot of fans never got a shot at him. It's a shame, too, since the character is so good. Yeah, the figure is entirely a repaint, but it's done so well that you won't even care. Heck, have him face off with Monkey Wrench, and you can re-create the two-pack where their molds originated.